Monster Energy AFTERSHOCK tickets go on sale Wednesday, June 8 at Noon PT at www.AFTERSHOCKConcert.com. Tickets are limited and will go fast. Fans are encouraged to buy early so they don't miss out on the chance to see so many iconic rock bands at one American festival. See below for details. 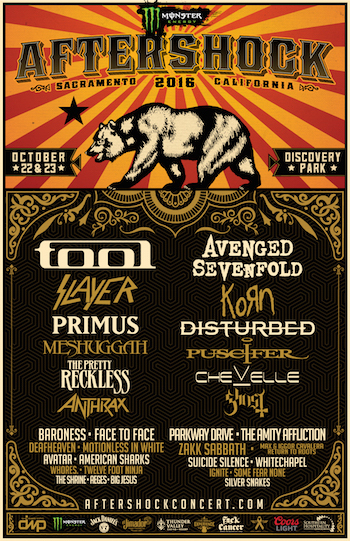 In 2015, a sold-out crowd of 45,000 was in attendance at Monster Energy AFTERSHOCK to experience the best hard rock, metal and alternative artists, along with gourmet food trucks and extensive onsite experiences. Loudwire.com called the festival "one of the nation's premier music events." Elsewhere, Johnny Firecloud of CraveOnline.com noted, "…Aftershock has found a new thread, and the way they're approaching the festival ecosystem may just defibrillate the soul of rock fests in America. They're mixing vibrant alt rock colors into what was typically a monolithic skull-and-crossbones metal template of black on black, side-stepping the big-box corporate model and building peripheral excitement through on-site activities, enhanced Gourmet Man Food attractions and more" (February 18, 2016). Coors Light, World's Most Refreshing Beer, is proud to sponsor the Monster Energy AFTERSHOCK Festival. The Coors Light Sports Bar will be showing college football games on Saturday and NFL games on Sunday, courtesy of Coors Light and Sacramento's KHTK Sports 1140 AM. Coors Light goes to great lengths to bring you the coldest, most refreshing beer. Please remember to drink responsibly. Keep Golf Metal is a movement that encourages festival attendees to play a 9 hole putt putt course with PGA level golf clubs provided by Rife Putters and MasterFit Custom Golf Clubs. Keep Golf Metal also has apparel that features designs that fuse the rock and golf worlds together. Take Me Home is a not for profit, volunteer based foundation that has been saving the lives of homeless animals since 2001. Many families living in low-income areas cannot afford medical care, basic vaccinations, or spay/neuter surgeries for their companion animals. The donations raised help us to fund mobile veterinary hospitals to travel into these under-served areas to provide free spay and neuter, vaccinations, microchipping and administer medical care for animals in desperate need. Take Me Home also supports local animal charities. Come by the booth to help out our furry friends by buying a shirt, signed merchandise, and entering a raffle. Danny Wimmer, Founder, DWP, said, "DWP is proud to support various charities, giving them a national platform to promote their messages. We are particularly fond of Take Me Home, which advocates for animal adoption. I hope everyone stops by their booth and supports their fundraising efforts to help animals in need." For more information, please visit: www.takemehome.tv. Monster Energy AFTERSHOCK Festival has partnered with Sacramento County Department of Regional Parks for the Life Looks Good On You life jacket water safety campaign. Danny Wimmer Presents is pledging support with Monster Energy AFTERSHOCK alumni and DWP friends to create awareness for the Life Looks Good On You campaign. So far, music artists that have joined the efforts include Sacramento's own Deftones, Rob Zombie, Disturbed, Five Finger Death Punch, Papa Roach, Pop Evil, and Avatar. Photos of band members wearing life jackets will be part of a social media campaign designed to encourage people to safely participate in water activities by sharing photos of themselves and friends wearing life jackets. A portion of all Monster Energy AFTERSHOCK ticket fees will be donated to Living the Dream. LTD Foundation bridges the music industry together with fans who are fighting terminal illnesses by giving them All Access VIP experiences backstage with their favorite bands and artists. Sponsors for Monster Energy AFTERSHOCK include: Monster Energy, Jack Daniel's, Coors Light, The Music Experience, Keep Golf Metal, Sound Exchange, Thunder Valley Casino Resort, Fxck Cancer, Take Me Home, KHTK, 98Rock, and SoHo Concessions. Discovery Park is a 160-acre park conveniently located near downtown Sacramento, where the American and Sacramento Rivers meet. The Discovery Park boat launch allows boaters access to both the American and Sacramento Rivers, and the park features bike trails, picnic areas, and a playground. Discovery Park is located beside I-5 near downtown Sacramento.